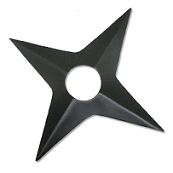 Effects: Basic strikes from throwing shuriken are increased by +10 Strength. Effects: Requires at least level 100 bow to fire. 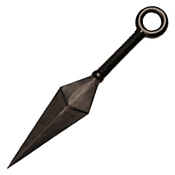 Basic strikes from firing arrows are increased by +20 Strength. Appearance: A wooden arrow with an iron tip. The feathers displayed on its tail are a beautiful shade of black. History: Made with all natural materials. Effects: This seal can be placed on almost any surface or attached to projectiles using string. When activated (takes 1 hand sign and 1 second to activate), the tag explodes with a 10 meter diameter. Anyone caught inside the blast will receive 1st degree burns wherever hit. Multiple tags can cause worsened burns. The damage type of this weapon is not affected by armor type. 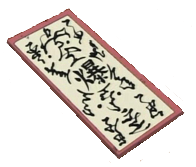 Appearance: A basic seal written on a small piece of bamboo parchment. Effects: Basic strikes with this weapon are increased by +50 Strength. Appearance: A stainless steel sword measuring 10 inches in blade length. History: A short sword designed for beginner swordsmen or experts who need a secondary blade. Effects: The user is considered to have +250 to their Iryō level for the purposes of transplants. Appearance: A thin, precision instrument. 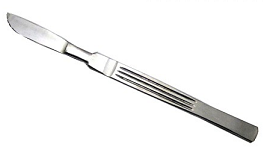 The blade measures 2" in length. History: Meticulously made by surgeons themselves. 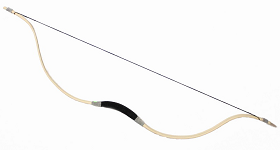 Effects: This bow requires 200 strength in order to load and fire. It takes 3 seconds to load and fire 1 arrow/bolt. This number is reduced by 0.0025 seconds * the user's speed. 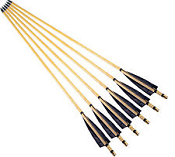 Arrows/bolts fly at 30 m/s and can travel up to 100 meters. Appearance: A wooden longbow with a taught drawstring. Effects: Basic strikes with this weapon are increased by +70 Strength. 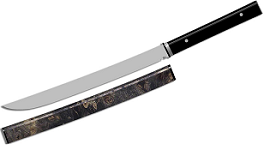 Appearance: A stainless steel sword with a slightly curved blade (measuring 25 inches in length) and a long enough handle to accommodate two hands. 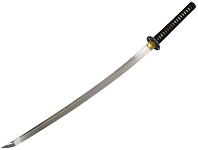 History: A traditional samurai sword with not much refinement. Effects: While folded up, the fan can be used for blunt attacks. While unfolded (takes 1 second each to fold/unfold), the fan can be used to blow gusts of wind at an opponent. Each time the user swings the fan, it will let out a burst of wind 3m in diameter. This wind travels at 20 m/s for up to 40 meters. It takes 2 seconds to swing the fan, and this number is reduced by 0.0015 seconds * the user's strength. 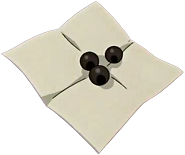 This gust is considered to be a basic attack, and anyone damaged by it will be pushed back 1 cm * the level of the strike (any strike over level 500 will also knock the opponent over). Damage will come in the form of short cuts covering anywhere hit, though the level of the damage is reduced by half. This fan requires at least 200 strength to use. Appearance: A large fan who's handle is made of pure iron. The diameter of the fan (when fully unfolded) is 3 meters. The design varies based on model. History: An incredible adaption of a traditional luxury. Effects: Increases user's Endurance by +25 where protected. Appearance: A standard headband with the wearer's native village engraved on the metal plate. History: Shinobi have worn them for generations to symbolize pride in their heritage. Effects: Increases the user's Endurance by +40 where protected, as well as raise their feet 2.5" off the ground. 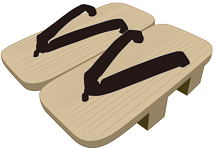 Appearance: A pair of traditional shoes made of sandal wood. History: Carved with care, but not too much. Effects: Increases the user's Endurance by +80 where protected. Also conceals the user's identity. Appearance: Varies based on the make and model. Effects: Increases the user's Endurance by +60 where protected. Appearance: Varies based on the origin. History: Hand crafted with materials native to its origin's natural resources. Effects: Increases the user's Endurance by +200 where protected. 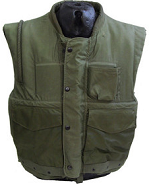 Also offers a number of pockets on the front/sides. Effects: Reduces damage from Ninjutsu by -50 levels where protected. Appearance: A thick, black cloak made of wool. History: Hand woven and tanned for several weeks. Effects: Standard wire to be used for a number of purposes. Default location is in ninja's left pocket. Appearance: Thin strings of wire. Effects: A container strapped to the user's back that can hold up to 50 arrows and a bow. Appearance: Standard quiver made of leather. Default location is on ninja's back. History: Hand-made by a local hunter. Effects: Can store items up to a cumulative level of 200. Releasing/storing item(s) takes 1 second per item. Activating the scroll costs 50 chakra. Appearance: A small tan scroll measuring less than a foot in length. There's a seal inscribed on the inside for storage, needing only the user's chakra to activate. Default location is in ninja's chest pocket if any, otherwise in their right pocket. History: A basic ninja utility. Appearance: Thin, fibrous material with several straps for security. Effects: Stops the bleeding from lacerations up to 3" deep over a 1 square foot in area. Appearance: Thin sheets of densely-woven, water-proof fabric. 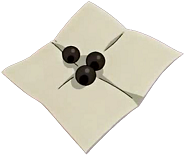 Default location is in ninja's pack if any, otherwise in their belt pouch. History: A standard medical supply used for treating minor wounds. Effects: Restores the user's chakra by 200. Appearance: Small black ball. Default location is in ninja's right pocket. History: Store-bought and not very good. Effects: Increases each of the user's stats by 50 for 5 posts when taken. After this effect wears off, the user suffers a loss of 10 levels to each of their stats for 5 posts. Appearance: Medium black ball. Default location is in ninja's right pocket. History: Store-bought and moderate quality.